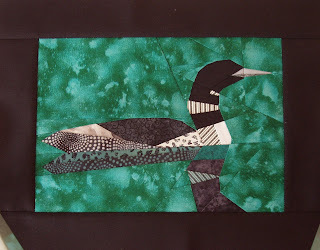 I finished the Loon block. It still needs the eye to be embroidered. I made the black boarder 1/4 inch larger than the instruction said as the layout sketch and the numbers didn't agree. I'll figure that one out later. This one was much easier than the hummingbird. I pinned the points at the neck that needed to match and they turned out pretty good. The reflection is kinda neat. I got a bit more hand quilting done this week and will continue to work on the boarders before moving back into the middle. I think I spent too much time over at Amy's Blogger's Quilt Festival checking out the over 400 submissions. Very inspiring, makes me want to finish something. I'll be back next week with another bird block. I, too, am having a hard time keeping up with the online Quilt show at Amy's. He has an eye now, so will post a new pic soon.